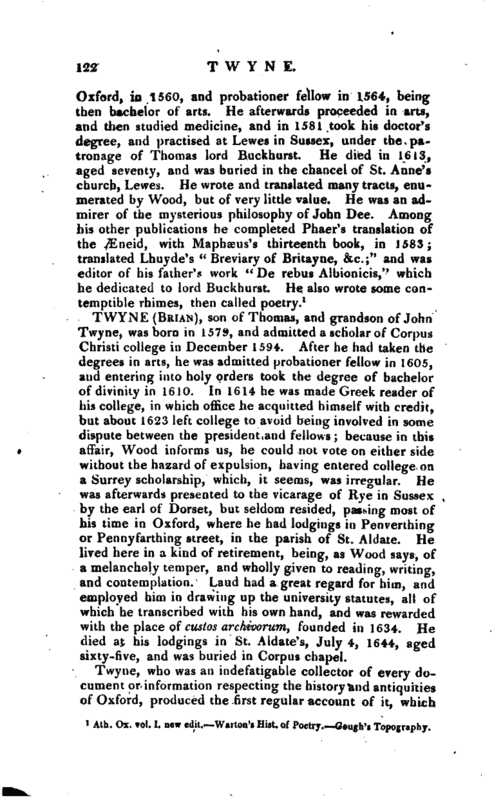 , one of a family of Oxford antiquaries, was the grandson of sir Brian Twyne, of Long Parish, in Hampshire, knight, and was born at Bolingdon, in the same county. He was educated at New Inn hall, Oxford, and admitted to the reading of the institutions in 1524, at a time when that society could boast of many excellent civilians. After he left the university he was appointed head master of the free-school at Canterbury, and in 1553 rose | to be mayor of the city, in the time of Wyat’s rebellion. By the school he became so rich as to be able to purchase lands at Preston and Hardacre, in Kent, which he left to his posterity. He was a good Greek and Latin scholar, and devoted much of his time to the study of history and antiquities. He was held in great esteem by men able to judge of his talents, particularly by Leland, who introduces him among the worthies of his time in his “Encomia,” and by Camden, who speaks of him in his “Britannia” as a learned old man. 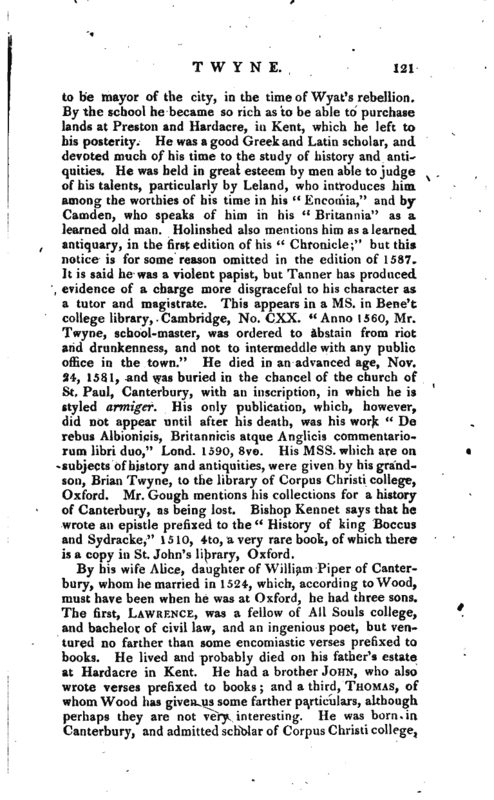 Holinshed also mentions him as a learned antiquary, in the first edition of hia “Chronicle;” but this notice is for some reason omitted in the edition of 1587. 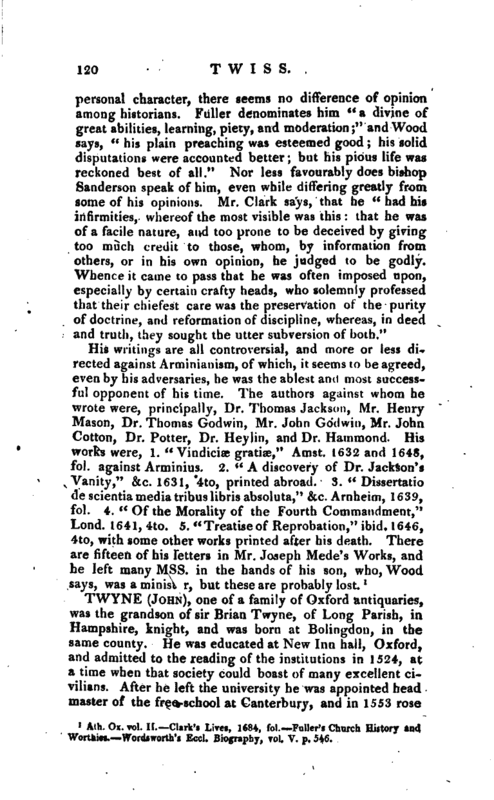 It is said he was a violent papist, but Tanner has produced evidence of a charge more disgraceful to his character as a tutor and magistrate. This appears in a ms. in Bene’t college library, Cambridge, No. CXX. “Anno 1560, Mr. Twyne, school- master, was ordered to abstain from riot and drunkenness, and not to intermeddle with any public office in the town.” He died in an advanced age, Nov. 24, 1581, and was buried in the chancel of the church of St. Paul, Canterbury, with an inscription, in which he is styled armiger. His only publication, which, however, did not appear until after his death, was his work “De rebus Albionicis, Britannicis atque Anglicis commentariorum libri duo,” Lond. 1590, 8vo. His Mss. which are on subjects of history and antiquities, were given by his grandson, Brian Twyne, to the library of Corpus Christi college, Oxford. Mr. Gough mentions his collections for a history of Canterbury, as being lost. Bishop Kennet says that he wrote an epistle prefixed to the“History of king Boccus and Sydracke,” 1510, 4to, a very rare book, of which there is a copy in St. John’s library, Oxford. 1 Ath. Ox. vol. I. new edit. Warton’s Hist, of Poetry. Cough’s Topognphy.